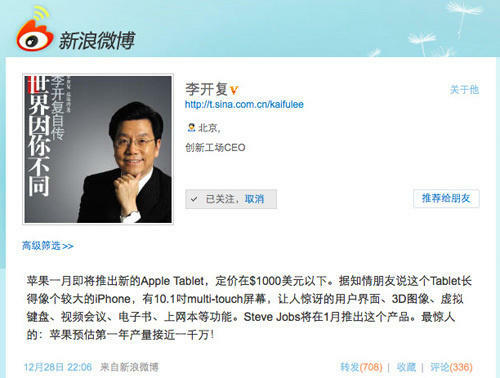 More tantalizing hints on Apple’s forthcoming tablet come their way to us today from China, where former Google China president Ka-ifu Lee has posted alleged hands-on impressions of the device on his sina.com.cn microblog. That’s not really telling us anything we don’t already know: Apple has been placing orders for 10.1 inch displays, and that the Apple Tablet will likely run on some flavor of iPhone OS, although we also know through various sources that the Apple Tablet’s UI will greatly expand upon the interface principles of the iPhone and iPod Touch. Moreover, recent Apple trademark applications for iSlate, Magic Slate and iGuide have made it clear that e-reading is going to be a major focus (though not sole functionality) of Apple’s tablet. A virtual keyboard is a no-brainer. In fact, about the only new detail here is the webcam, which I haven’t heard anyone talk about before, but makes sense: my guess is, like Apple’s laptops, it will be front mounted. In other words, this could be verification of a whole slate of the most plausible Apple Tablet rumors… or just as easily be a compendium of them by a man who hasn’t actually seen the device. Still, given Mr. Lee’s ties with Apple go-to manufacturer Foxconn, I wouldn’t be surprised if his prediction pans out when the Tablet is announced next week.